What to wear on a picnic? We are almost in the middle of January and I'm still having a hard time saying 2019!! In this year I'm all about embracing life, taking chances, meeting new people, visiting new places, being more myself and a little bit carefree. Taking a break from whatever you're going through at the moment is OKAY and NEEDED, we deserve to reset sometimes and pause the storm for a second and just breathe and enjoy the great things that surround us every single day. 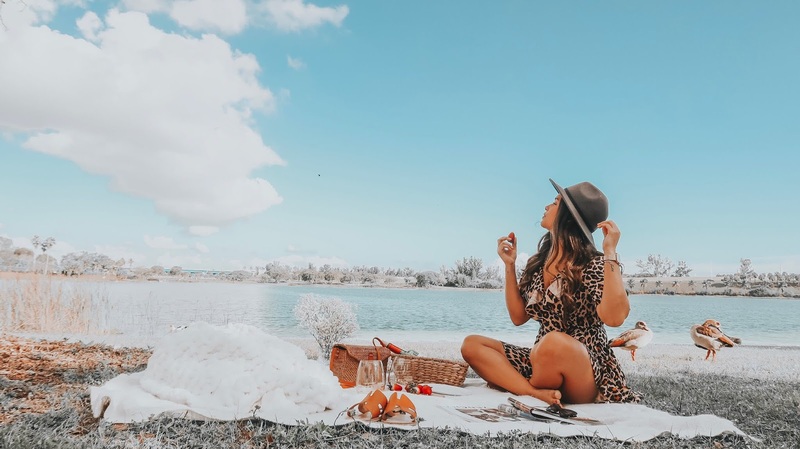 This time I felt like doing something different with my husband so we had a picnic in our Sunday afternoon, we enjoyed the nice weather, our company, the ducks, the clouds, life in general. Time is indeed going so fast it's scary, so make sure to slow down the pace of your daily routine for a moment and appreciate, just appreciate. Hope you're having an amazing start of the year and really wish you could accomplish all the goals you've set for yourself and if you don't have any yet, everyday is an opportunity to start over, why not start today? ¡Ya casi estamos a mediados de enero y todavía me cuesta trabajo decir 2019! En este año, me enfocaré más en disfrutar la vida, aprovechar oportunidades, conocer gente nueva, visitar nuevos lugares, ser más yo y soltar un poco las preocupaciones. Tomar un descanso de lo que está pasando en el momento es ACEPTABLE y NECESARIO, merecemos reajustar algunas veces y detener la tormenta por un segundo y simplemente respirar y disfrutar de las hermosas cosas que nos rodean cada día. Esta vez sentí ganas de hacer algo diferente con mi esposo, así que hicimos un picnic en nuestra tarde del domingo, disfrutamos del buen clima, nuestra compañía, los patos, las nubes, la vida en general. El tiempo pasa tan rápido que da miedo, así que asegúrate de bajar el ritmo de tu rutina diaria por un momento y aprecia y agradece. Espero que estén teniendo un excelente comienzo de año y que realmente puedan cumplir todos los objetivos que se han propuesto y, si aún no tienen ninguno, todos los días es una oportunidad para comenzar de nuevo, ¿por qué no comenzar hoy? I'll be sharing more about it on a Home Decor post, but it's so gorgeous and comfy I had to talk about it now!! I definitely agree with you. Taking a break from certain things is needed and healthy to do! That outfit is fabulous. Love the print!